Funeral services for Mary Lou Crigger, 83, of Cullman, will be 1 p.m. Tuesday, April 16, 2019 at Cullman Heritage Funeral Home Chapel, with interment at Flint Creek Cemetery. Rev. Floyd Bradford and Jerry Freeman officiating. 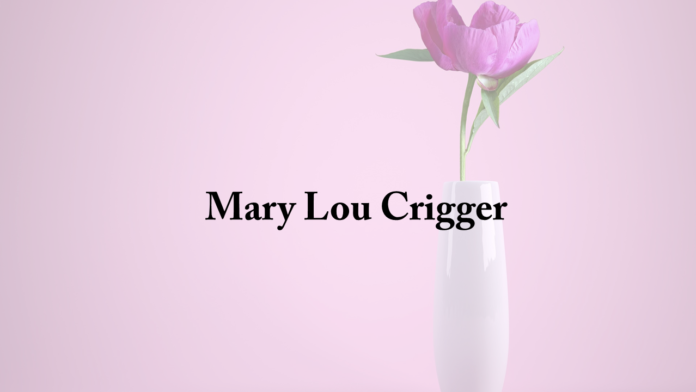 Mrs. Crigger passed away Friday, April 12 at her residence. She was born July 16, 1935 in West Virginia to James And Nora Talbert. She is survived by her husband, L. Clinton Crigger, children Beth (Irv) Grant of Clarkshill, SC, Clint (Judith) Crigger II of Manassas, VA, Greg (Vanessa) Crigger of Chipley, Fl, and Danny(Wendy) Crigger of Warrior, Al; grandchildren Stephanie (Matt) Platt, Lee Clinton Crigger III, Luke Crigger, Hope Crigger, Seth Crigger, Isaiah Crigger, Abigail Crigger, Samuel Crigger, James Crigger, John Crigger, Michael (Brittany) Crigger, Justin (Lacinda) Litz, Katie Fleming, Stephen(Casey) Crigger, and Dalton Crigger; great-grandchildren Madison, Rosie Platt, Ava, Shyler (is on the way), MollyGrace, Kaden, Zander, Decklin, Tucker, Chase Allen, Nevaeh, Collin, Hunter, Braxton, Tripp, and Ali. Visitation will be Tuesday, April 16, from 11 a.m. until 1 p.m. prior to the service at Cullman Heritage Funeral Home.